I thought I'd make some simple chocolate cupcakes with cocoa whipped cream for some friends who were coming over for dinner tonight, but in my enthusiasm for efficiency, I started making them while I was cooking dinner last night. Well, when I tried one of the baby cupcakes after they'd cooled, I thought, "Hmm...these have a weird, dry texture, and they're kind of on the salty side." Then I remembered the sugar. Too bad I didn't remember it WHILE I was mixing the batter. Fortunately, this recipe uses Ghirardelli Sweet Ground Chocolate, so there's already some sugar in there, but these were definitely not quite right. 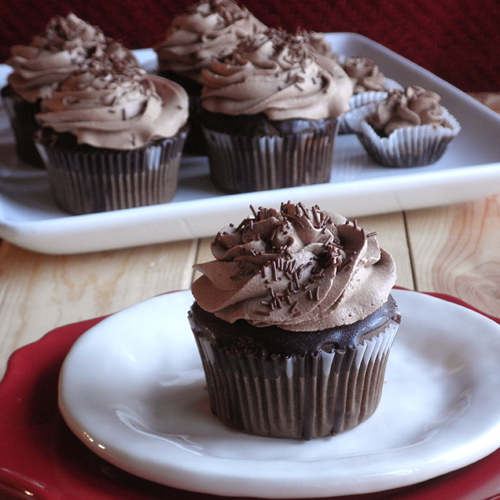 So, I decided to add some sweetness and richness by dipping the tops in a dark chocolate ganache before frosting them with the cocoa whipped cream. In the end, I thought they tasted FINE. Next time, I'll make sure I add the sugar, but I will definitely be able to finish off the ones that remain in my fridge. I even think my husband will be able to choke some down. Line a 24-cup muffin pan with cupcake liners. Into a mixer bowl fitted with a whisk attachment (or in a large mixing bowl if you're using a hand mixer), sift flour with ground chocolate, cake enhancer, sugar, baking soda, cream of tartar, and salt. Add butter and 3/4 cup buttermilk. Beat on low speed to combine ingredients. Scrape sides of bowl and then beat on low-medium speed for 2 minutes. Add 1/4 cup buttermilk, eggs, and 1 teaspoon vanilla. Beat additional 2 minutes. Scoop/pour batter into a gallon-sized zip-top bag and cut about 1/2-inch off one corner. Pipe batter into cups, 3/4 full. Bake at 350ºF for 15-18 minutes, or until a toothpick inserted into the center comes out clean, or with only a couple of cling-ons. Cool in pan 5-10 minutes and then carefully remove cupcakes to finish cooling on a wire rack. Poke 12-20 holes in each cupcake with a toothpick. With a spoon, spoon on about 1 teaspoon or so of ganache onto each cupcake, or dip each top into the ganache and then turn upright back onto rack. 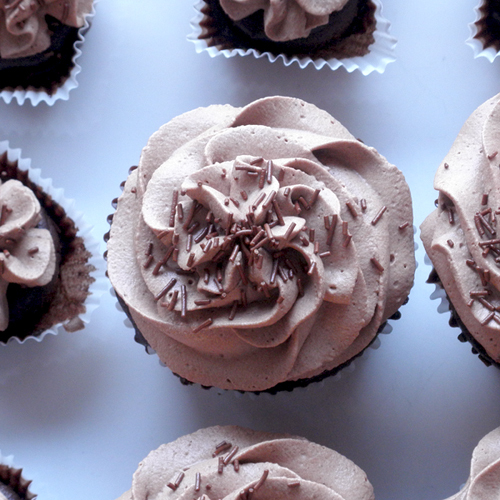 Refrigerate cupcakes until ganache is firm. Pipe cocoa whipped cream onto each cupcake and top with sprinkles, if desired. Keep refrigerated until ready to serve. In a heavy saucepan, bring cream to a boil. Remove from heat. Stir in butter until it melts. Stir in chocolate until all is melted. In mixer bowl with a wire whisk attachment, mix cocoa, sugar & hot water, mixing to form a paste. Allow to cool before adding cream. Add cream and start mixing on low to incorporate cream into cocoa paste. Stop the mixer and scrape the bowl. Mix on high until stiff peaks form. Made these and they were DELICIOUS! Thanks for this great recipe! Glad to hear it, Kristen! Thanks for letting me know! Well, thanks for the kind words. I appreciate them. :) If you look in the box at the right titled "Kelly's Favorite Mostly Food-Related Links" you'll see some of my favorite recipe sites. Of those, I think my favorites are Simply Recipes, How Sweet It Is, and Collecting Memories. I'm going to go check out your web site now. Re: Dark chocolate ganache...how much is 1 T ?? Sorry, the "T" = Tablespoon. Until I was well into this blogging thing, I hadn't realized that not everyone abbreviates (or even has) measurements like this. I'll fix it in the recipe too.